Essential oils are concentrated oils extracted from plants. They are called “essential” for they contain the characteristic fragrance of the plant from they which they were distilled. People have been using essential oils to treat a variety of conditions for centuries. In the complementary medicine called aromatherapy, you apply the essential oil to the treatment site or rub it in. In some cases, you immerse the affected body part in the oil. Tea tree oil, also called Melaleuca, has antibacterial and antifungal properties. A 1990 study found that tea tree oil worked as well as benzoyl peroxide at treating acne. Tea tree oil’s antibacterial properties mean that it can fight off the bacteria that cause acne. Tea tree oil can also control oil production in the skin and thus reduce the number of breakouts. You can also use tea tree oil to treat minor scrapes and cuts. While the daisy-like chamomile is better known for its tea, it also produces an essential oil with antiseptic and anti-inflammatory properties. It can reduce irritation and redness as well as prevent infection. You can thus use chamomile to treat eczema, rosacea, acne, and cracked skin. It is also gentle enough to be safely used on sensitive skin. Carrot seed oil is another one of the essential oils for skin care. Carrot seed oil contains a lot of Vitamin A, which is a retinoid and thus stimulates the production of collagen. Vitamin A also helps the body replace old skin cells with new ones. Carrot seed oil can reduce scarring and make the skin smoother. It also contains a lot of antioxidants that reduce inflammation and slow the development of wrinkles. Frankincense oil can be used on all skin types. Its anti-inflammatory and antibacterial properties make it one of the best essential oils for treating acne. It also helps stimulate the production of new skin cells and thus helps tighten skin and reduce wrinkles. Frankincense oil also improves skin tone by evening the complexion and making pores less visible. Frankincense can soothe dry and chapped skin. Lavender oil has multiple uses. In addition to helping people relax and get a good night’s sleep, lavender oil can help regenerate the skin by encouraging the production of new skin cells to reduce scarring and sunspots. Lavender oil can also soothe inflammations and clean scrapes and cuts. You can also use lavender oil to relieve the pain and inflammation caused by bee stings, spider bites, and fire ant bites. Geranium oil helps prevent acne by controlling the skin’s oil production. It stimulates the skin’s healing process by promoting blood flow to areas that need it. You can, therefore, use geranium oil to treat conditions like eczema, bruises, ringworm, burns, dermatitis, cuts, and broken capillaries. Ylang ylang oil comes from a tree native to the Philippines, Malaysia, and Indonesia. 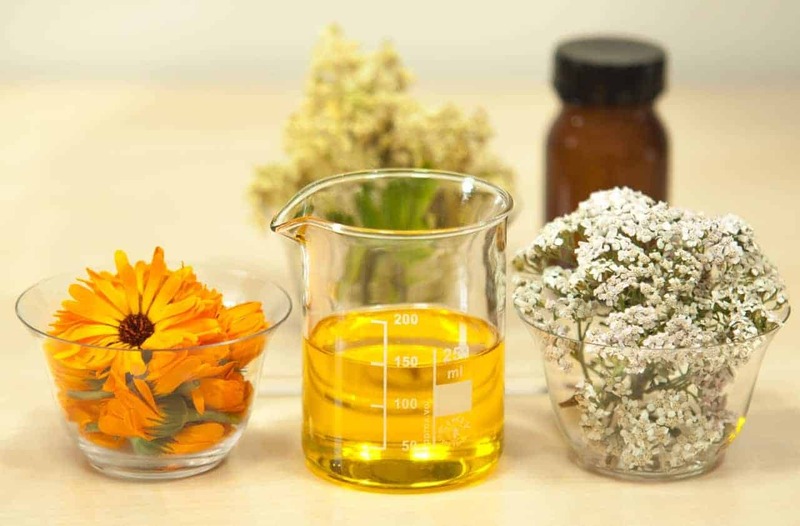 The essential oil has a flowery scent and helps control acne by regulating the amount of oil produced by the skin. It also improves skin elasticity and reduces fine lines by stimulating the production of new skin cells. Basil oil has antimicrobial and antibacterial properties that help prevent infection and reduce inflammation. You can also use basil to treat bee stings and insect bites. Neroli oil, which comes from the bitter orange tree, was named after the Princess of Nerola, Anne Marie Orsini, who was the first to use the oil as a perfume for her gloves and bathwater. It is also rumored to be one of the ingredients of Coca-Cola. As one of the essential oils for skin, neroli oil contains citral, a chemical that stimulates the production of new skin cells. It thus tightens skin and reduces fine lines, wrinkles, and stretch marks. It is also an antiseptic and can regulate the skin’s oil production. Rose oil has anti-inflammatory and antimicrobial properties that help promote healing. It also reduces water loss and thus helps dry skin. Some people use rose oil to treat conditions like dermatitis and psoriasis. In the latter case, you can use rose oil to soften the affected areas. While essential oils can be effective, you need to use them carefully. You should always dilute an essential oil with a carrier oil or other ingredients like charcoal, clay or shea butter. 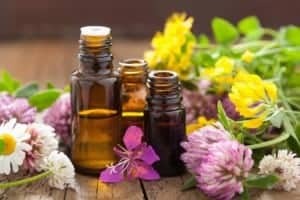 You need to make certain that the essential oil does not make up more than five percent of the mixture. For example, 20 drops equal one ml, so you should use no more than one drop of essential oil for every 20 drops of carrier oil. It’s also a good idea to do a patch test on your forearm to make sure your skin doesn’t react badly to the oil. Some essential oils, like peppermint, bergamot, and rosemary, can irritate sensitive skin.